Monday, April 8, 2013: Up early and check the weather…..Severe winds predicted from the west, and we are headed due south…..the worst possible situation for towing a trailer! According to the forecast, the winds are to increase through the morning to 40 MPH, gusting to 60 MPH by early afternoon. So…..the choices are to remain in Flagstaff another day, a not too unpleasant situation, or to head out immediately and try to beat the worst of the weather. We leave in about 15 minutes and jump on I-75 heading south. Experiencing some wind buffeting of the trailer so I pull over and took another turn on the sway control, which seems to minimize the effect of the strong westerly wind. Within two and a half hours we have descended from 7000 feet to 1000 feet and watched the temperature rise from 44 to 73 degrees. Also, more importantly, as we entered the outskirts of Phoenix the apparent winds started to diminish. Still being early in the day and since we skipped breakfast we decided to treat ourselves to a nice meal at a Cracker Barrel. Now fortunately, most Cracker Barrel’s cater to the RV’ing public and feature large, long parking spots in the rear of the restaurants. However, if you miss the driveway and have to make a steep, off camber u-turn then stuff tends to fall off. The radical turn combined with the extreme angle had un-weighted the Port WD bar to the point that it just simply fell out of its socket. There is a keeper that is supposed to prevent this from happening but it had not been seated properly by someone last time someone hooked up the truck to the trailer! Fortunately we were moving along at about 1 MPH at this point and the resulting noise brought us to an abrupt stop. Oh, well…..no harm, no foul! And another item to add to the old pre-underway check sheet! So, why are we in Phoenix? 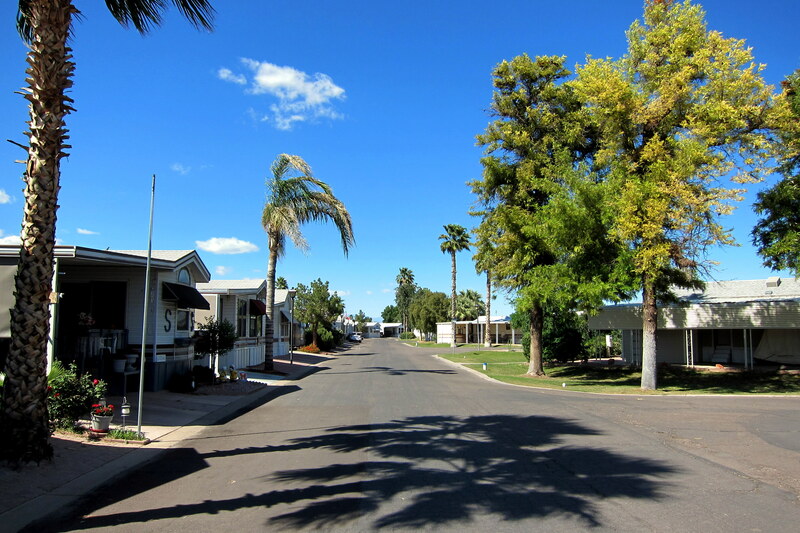 Well to begin with tomorrow is Kit’s birthday and she wanted to spend it in her favorite campground…..Paradise RV Resort, or as I call it “Tiny Town”, which is located in Sun City just west of Phoenix. Tiny Town is like a mini city made up of tiny homes and tiny vehicles driven by a very diverse and eclectic population. We were assigned a spot in the overnight section but had full access to all the amenities of the park, which are many. We have mentioned this facility in past journals so won’t detail all there is to do, just suffice it to say the active senior will not be bored! In addition to being in a nice RV park, a couple of our favorite people live a few miles away and we wanted to pay them a visit. Marti and her husband Tommy as well as Marti’s father Mr. “O” all have retired from California to Sun City. They are family to my best friend from childhood, Rod who we visited in San Diego a few months ago. Tommy has been battling some health issues but we were able to enjoy a visit with him at his very nice rehabilitation facility. Pulling up in front of Marti’s home, which borders a golf course and is easily identifiable by the manicured Carob Tree in the yard, I noticed a rather unique apparatus out by the curb that required my investigation. Looked a lot like an Olangapo Bomb Site but was actually an underground trash can, and quite a large one at that. Apparently one just has to take their trash to the curb, step on the lid to open and…..”bombs away”! Pretty slick! As we were knocking on Marti’s door and discussing this modern contraption, a total stranger answered the knock. Um, apparently there are many homes on the golf course, with manicured Carob trees and underground trash bins. Marti’s home was a few doors away…..we did have a very nice visit with Carol, however! 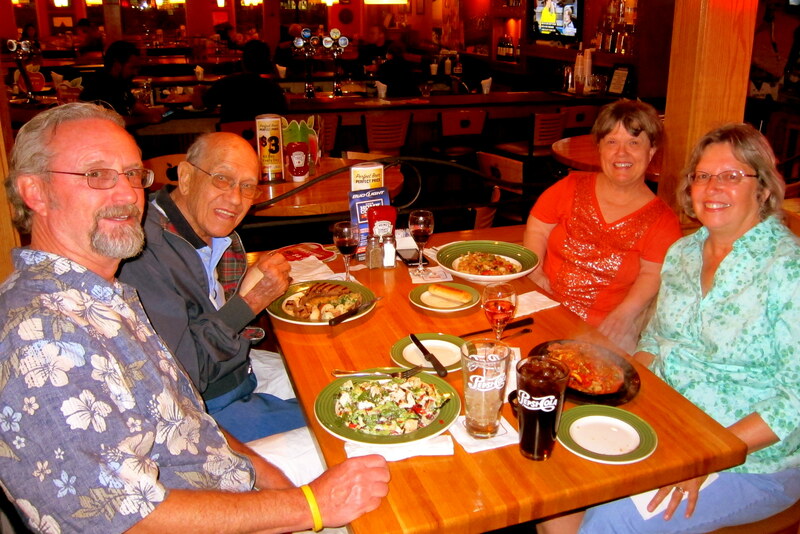 Since Marti has treated us to many home cooked meals over the years, we offered to take her and Mr. “O” out for a meal. So the four of us retired to the local Applebee’s and had a great time reconnecting and telling childhood stories. Mr. “O” is 96 years young and still lives independently, drives and plays golf…..a true inspiration for living life well and choosing only the finest Whiskey to consume! 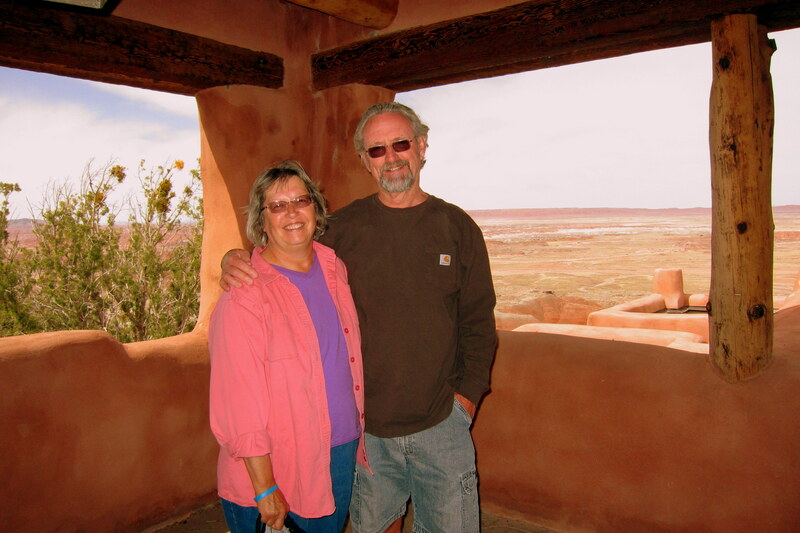 Tuesday, April 9, 2013 through Wednesday, April 10, 2013-Tiny Town, Sun City, Arizona: Happy Birthday Kit! The weather was perfect for our stay, clear, sunny, warm and a gentle breeze. We spent one day oz’ing about town and enjoying a delicious Italian meal. Spent the rest of our stay just veg’ing out, walking about Tiny Town and trying to figure out why we owe so much in Federal Taxes! Also, as Kit relaxed by the pool with her book, I was able to wash the truck and trailer of the accumulated road grime and take care of some badly needed maintenance. A rather persistent water leak developed up in Flagstaff…..after thoroughly investigating all the common causes I spent a few hours taking various panels off trying to identify the source of the leak. Suddenly it stopped as abruptly as it started so I just decided to wait and see what developed down the road (pun intended). While seeking out a mailbox to send out the tax forms, I noticed the Southern California affliction of trying to disguise ubiquitous cell towers as native vegetation existed in Tiny Town as well. 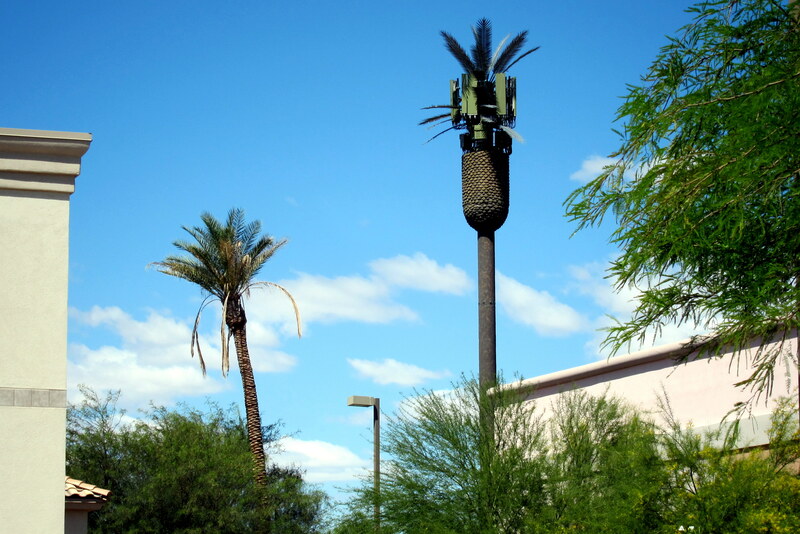 At least these folks used palm trees…..see the tower is totally unrecognizable from the actual nearby tree! Thursday, April 11, 2013: Up and away by 0950 under sunny skies and temperatures rising into the upper 60’s. 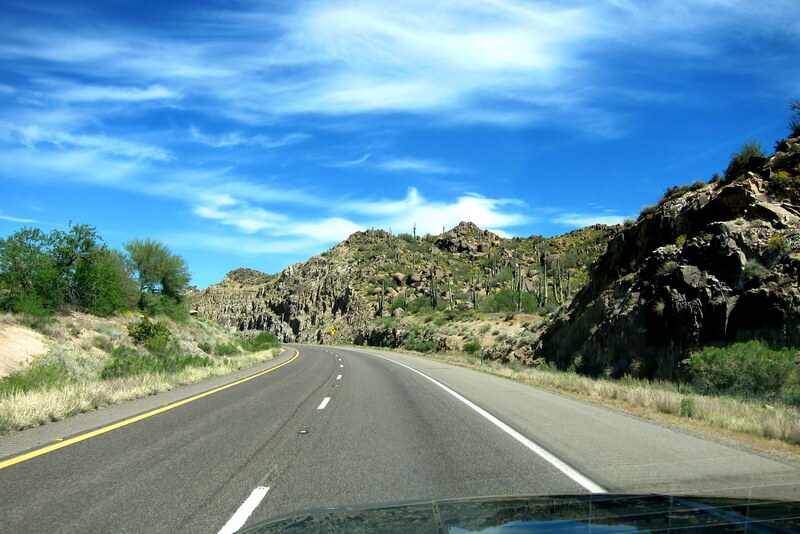 Jumped on US-87 heading north through the Tonto National Forest toward Payson, Arizona. As we passed 2000 feet elevation the signature Saguaro Cactus started appearing. 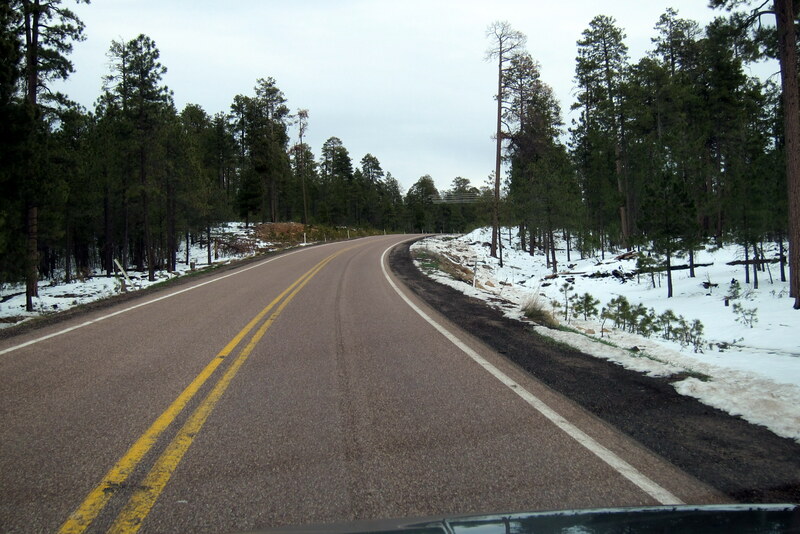 And as we passed 5000 feet the uncharacteristic for Arizona snow started appearing….SNOW!!! YIKES!!!! Near the town of Payson, Arizona we moved over to AZ-260 heading east toward Show Low. 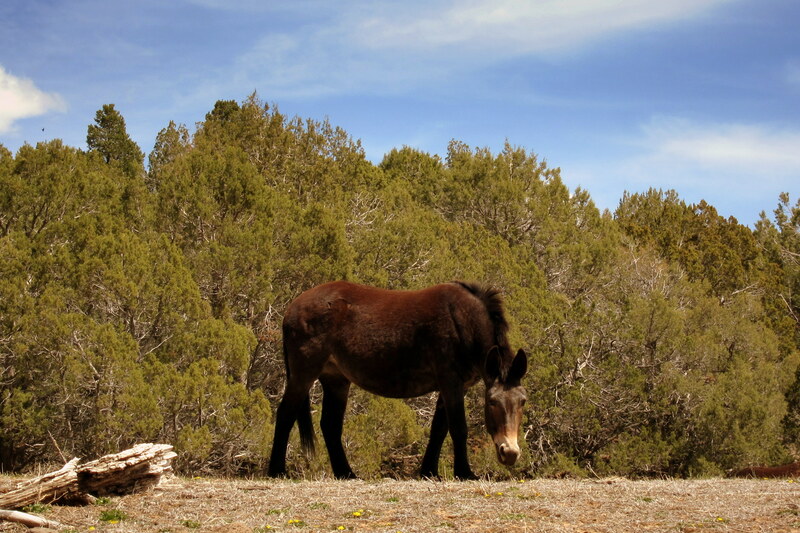 As we popped over the Mogollon Rim at 7000 feet, there was no snow and the weather was pleasantly sunny and cool. The Mogollon Rim defines the southwest edge of the Colorado Plateau, an immense area that encompasses part of Nevada, Colorado, Arizona and New Mexico, and called “The Four Corners”. 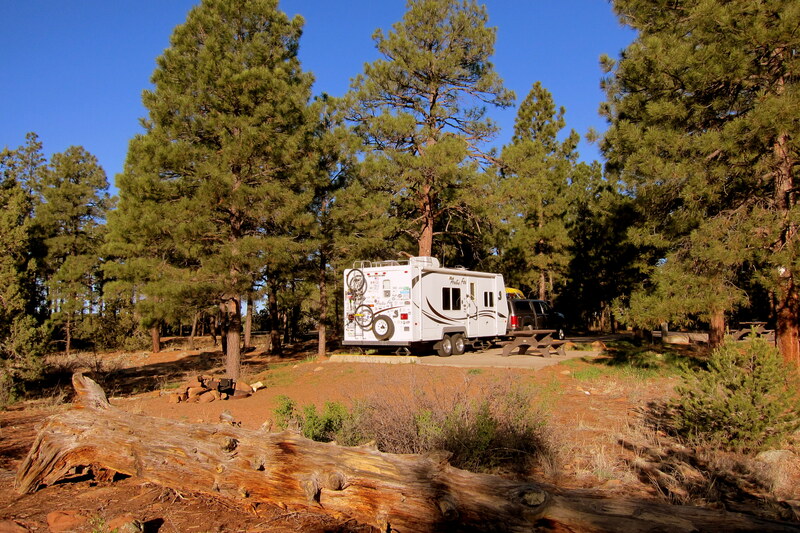 On the Mogollon Rim trees, plants and animals associated with the Rocky Mountains flourish. 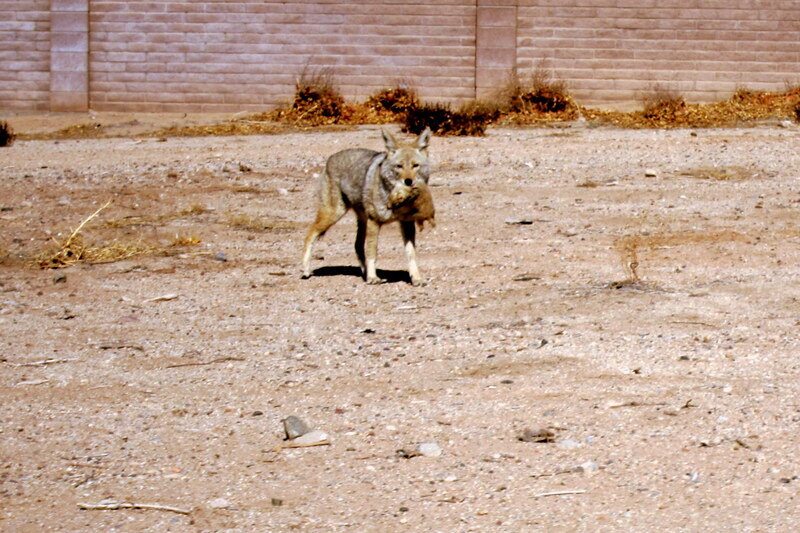 Off the rim, down in the lowlands, one finds the typical terrain and environment of the Sonoran Desert. A pretty dramatic contrast in a relatively few short miles. 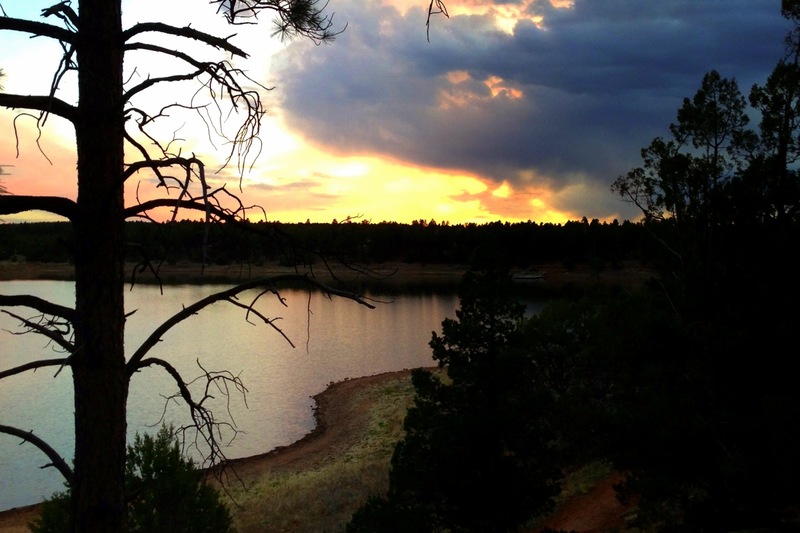 As we neared the mountain town of Show Low we decided to stop for the night at Fool Hollow Lake State Park. This alpine lake situated in the Sitgreaves National Forest has a very nice campground and is a place we have enjoyed on past trips through the area. Pulling into the sparsely populated campground we set up on a nice remote campsite for the next couple of days. Where we enjoyed cocktails while watching the sun set over the lake placid lake. Friday, April 12, 2013-Fool Hollow State Park: Today is a down day to do what we wish. Kit wishes some quiet time to read and reflect so that means Bill wishes to disappear. And Disappear I did…..rolled my kayak the 200 yards to the lakefront and took off to paddle about. 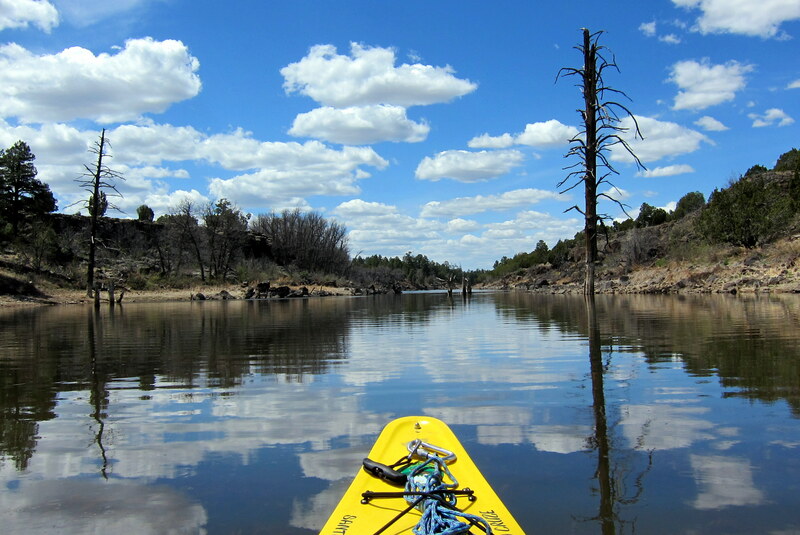 As I paddled north the lake narrowed to a shallow stream. As I was about to turn about I had the weird sensation that some jackass was staring at me. I bet he was thinking the exact same thing! Not sure where that fellow came from as there was no sign of human activity for a number of miles about. 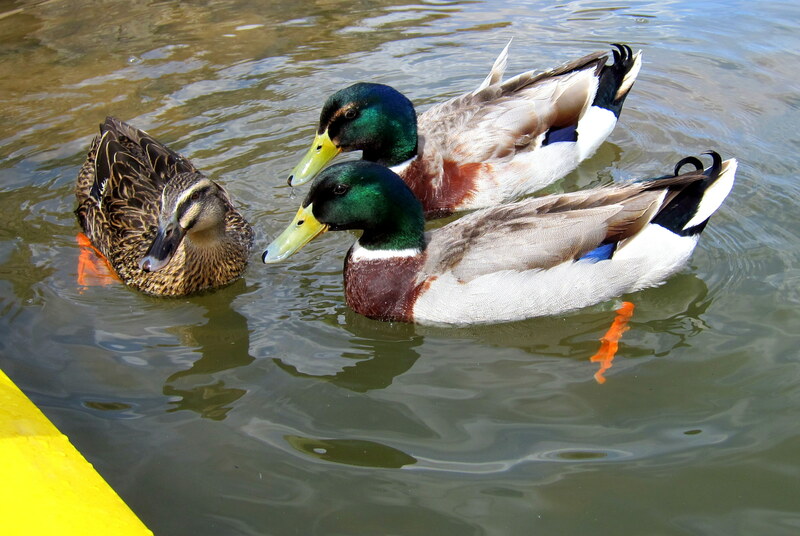 We warily watched each other until I rounded a bend in the lake. Just another of a series of chance encounters that seem to present themselves. On the return paddle to the campground I heard a loud rumbling sound and as I looked toward the source, I spotted this immense propeller driven aircraft. 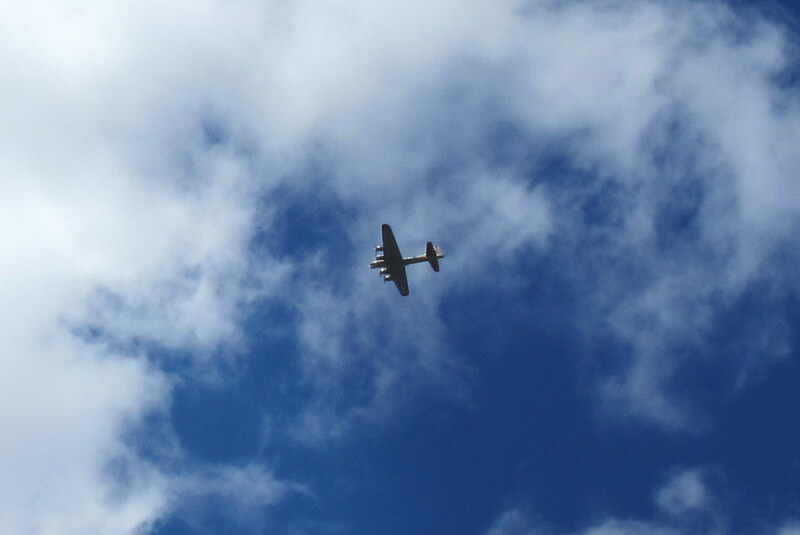 According to Tommy, my ace number one plane spotter, this aircraft is a WWII vintage B-17 Bomber! Of the thousands that were built only about 20 remain airworthy so I’m guessing this guy must have been going to an air show somewhere out west. 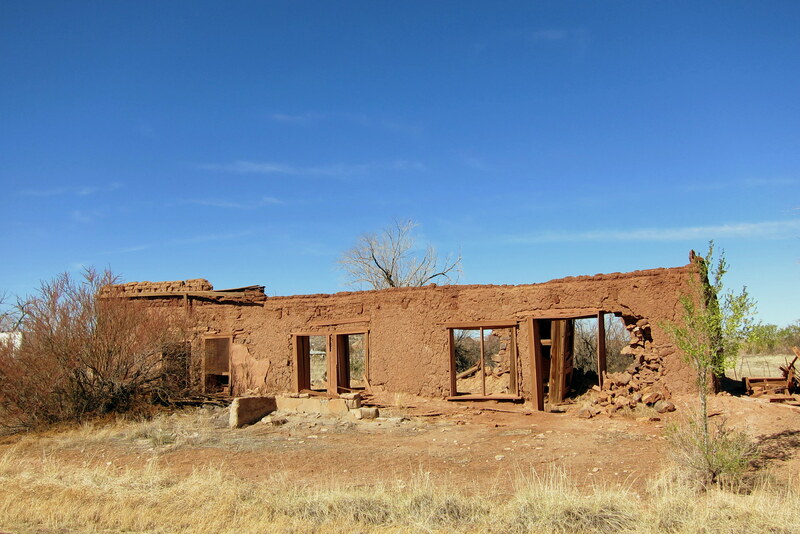 Sure was a thrill to see and hear that historic bomber fly over this remote part of Arizona. Speaking of birds, as I was about 10 feet from shore and getting ready head back to camp, I came upon these three making a big ruckus. The two males were pestering the female and at one point they started fighting each other, presumably for her attention. All this took place within a few feet as I tried to paddle the kayak out of their way. 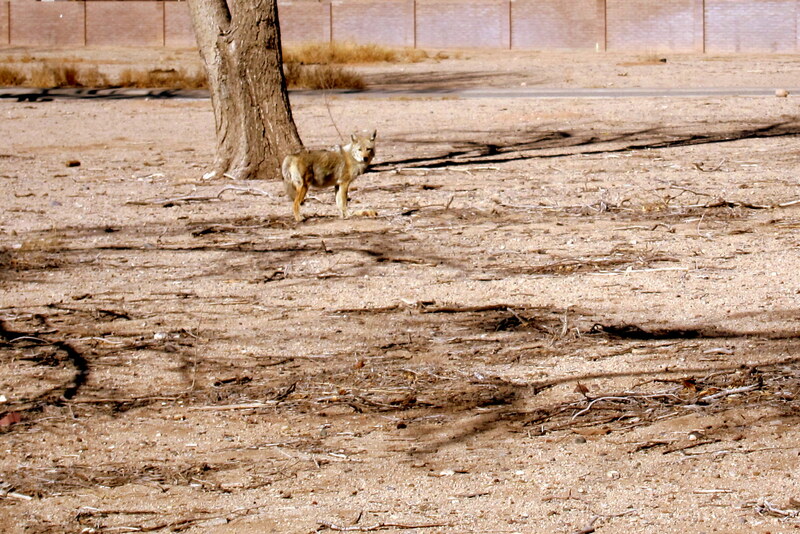 They paid no attention to my presence however and continued their courting ritual. After a few minutes, the female took wing and the two males followed in hot (pun intended) pursuit! What a great day on the water in a beautiful area! 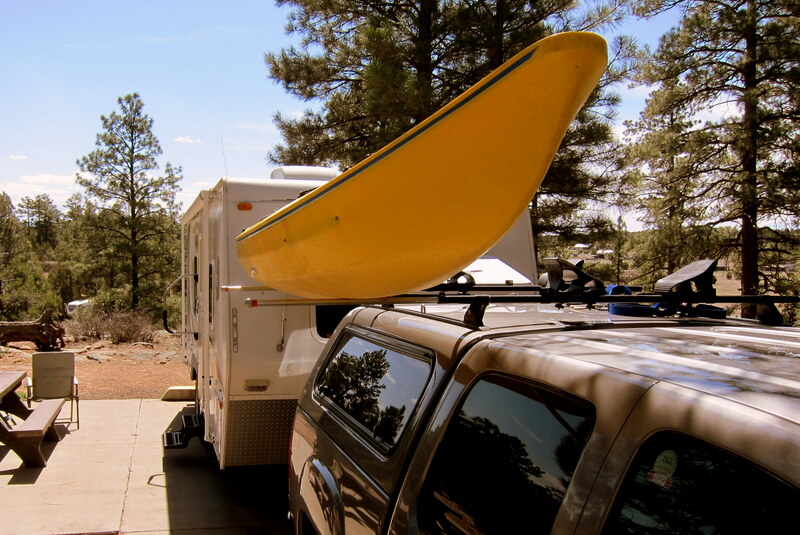 Just a few quick notes on maneuvering a kayak off the truck and down to the water. Normally sliding the boat off the rear of the truck is the easiest; however with the truck attached to a trailer this is far more difficult. 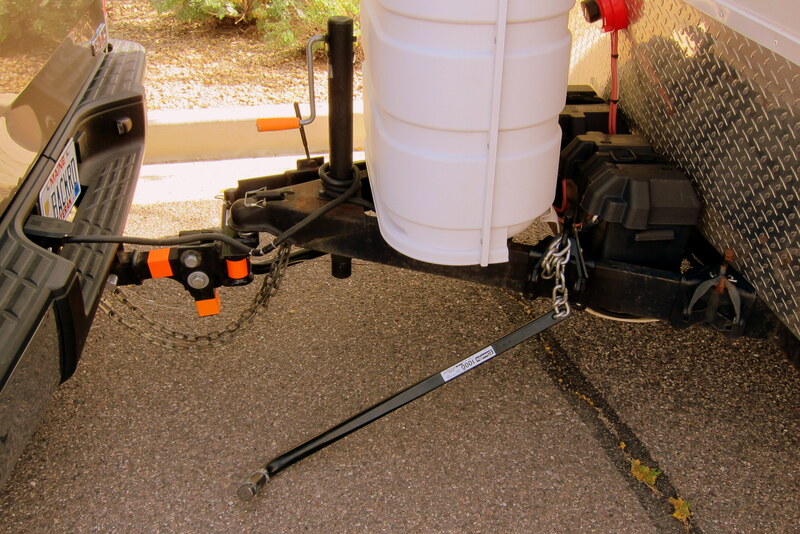 There are bar extenders that one can purchase that simplify removing the boat from the side of the truck. However, they are about $200.00 and I’m basically pretty cheap. For about $25.00 in galvanized water pipe and fittings you can make your own. 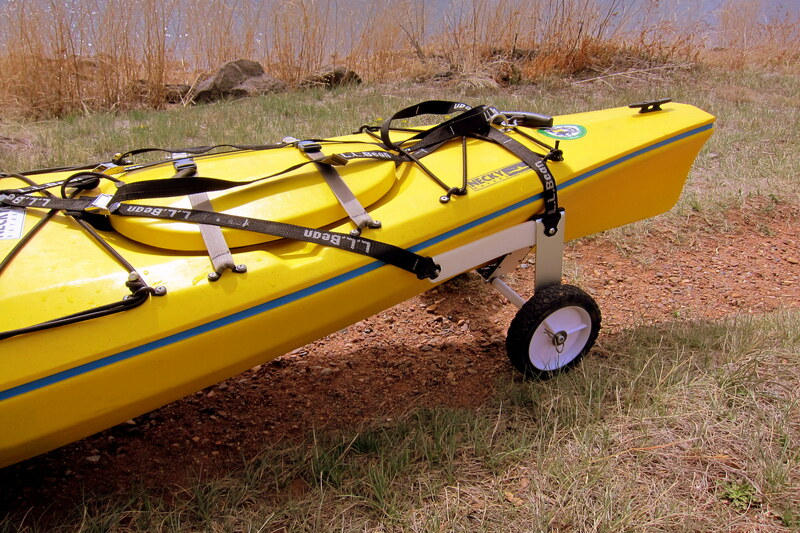 The pipes, once stuck inside the hollow rack bars, allow me to maneuver the boat out of the kayak saddles and slide it clear of the truck where I can more easily lower it to the ground. Wish I could say that was my idea……however I got the tip off the internet. Now once the boat is off the truck, how to get it some distance to the water. Well, LL Bean sells a Portage Cart that handles this chore quiet well. This is the second set of these I’ve owned…..the first pair lasted about 15 years and endured a lot of punishment during the many river trips in northern Maine over the years. In fact, even though not in very good shape they are still in service out at camp transporting kayaks to the river and back. Just thought all this might be of use to fellow kayakers. That evening, we were able to Facetime with good friends, and fellow RV’rs, Vince and Candy. They were spending a few weeks in Key West, Florida before heading to Arizona for some family business. The sunsets they shared with us pretty much made up our mind that we need to get back down to the Florida Keys in the near future. Great talking to and seeing you folks…..safe travels! Saturday, April 13, 2013: Woke early to a clear cool morning. After breakfast, we broke camp and were on the road by 0830. Decided on US-60 heading east and then moved over to Highway 108 which rolled through the little Indian village of Concho. 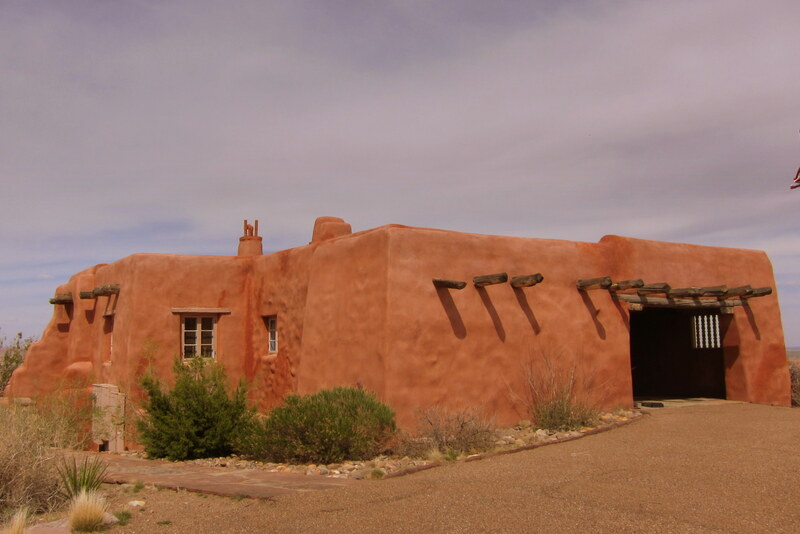 There were some newer houses but a lot of older adobe dwellings as well…..some still occupied. 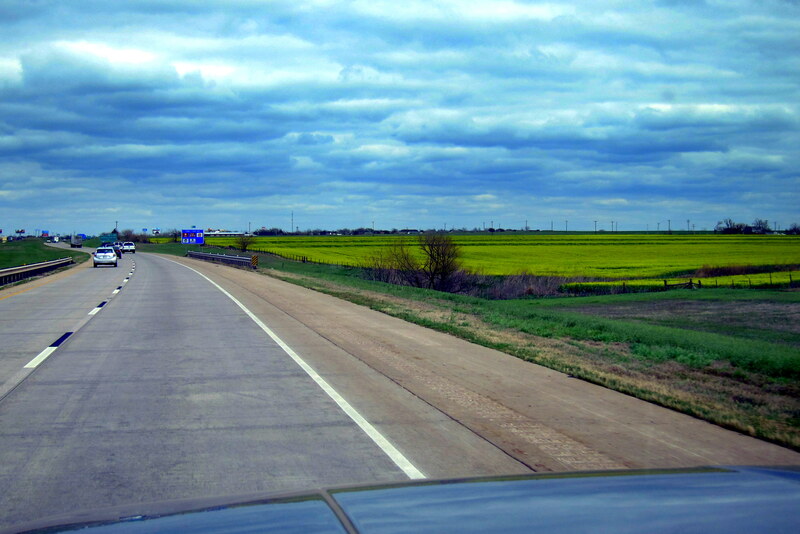 US-180 heads north through some pretty desolate countryside. 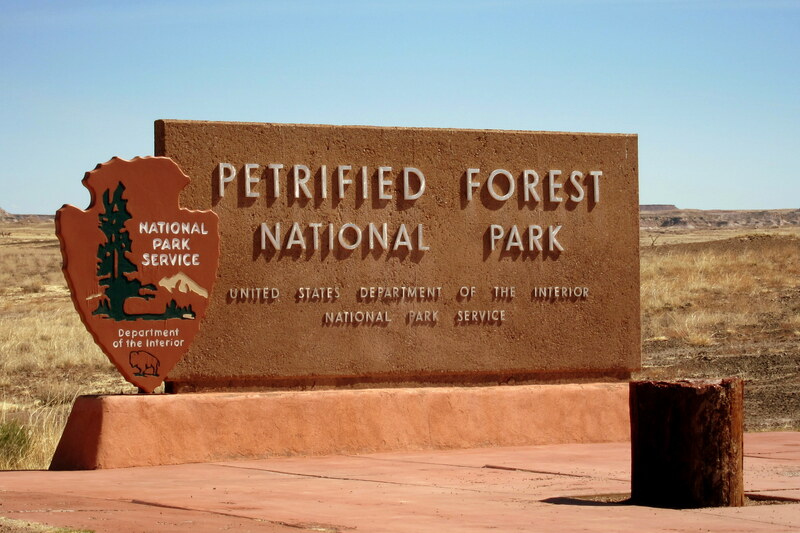 Soon we came to the southern entrance to Petrified Forest National Park. 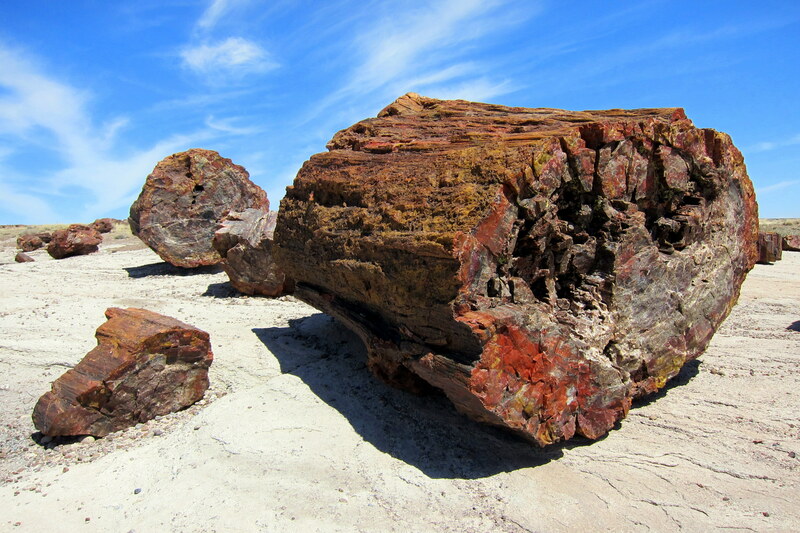 The fossils that are protected by the park are actually trees over 225,000,000 years old that had been buried by river sediment and volcanic ash. Groundwater carried silica from this mixture into the cells of the trees where it replaced the organic structure and hardened into stone. Various minerals in the water caused some of the fossils to display a rainbow of colors. 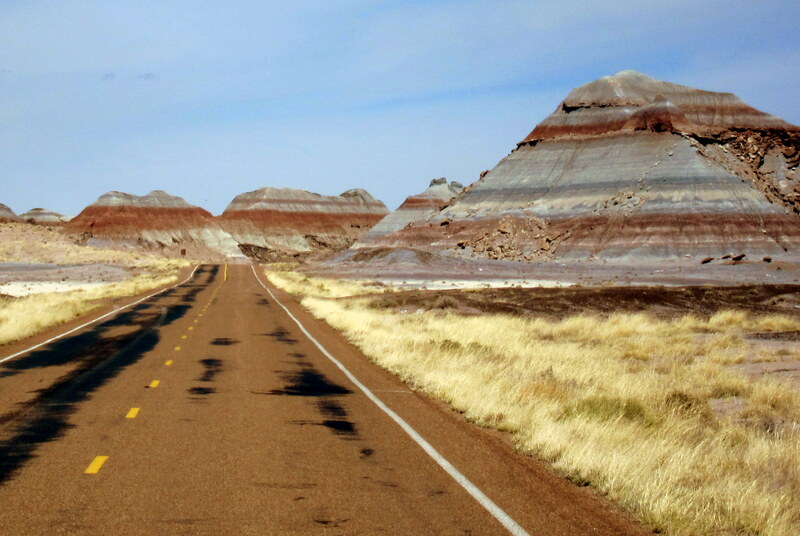 At the northern end of the park lies The Painted Desert National Park. 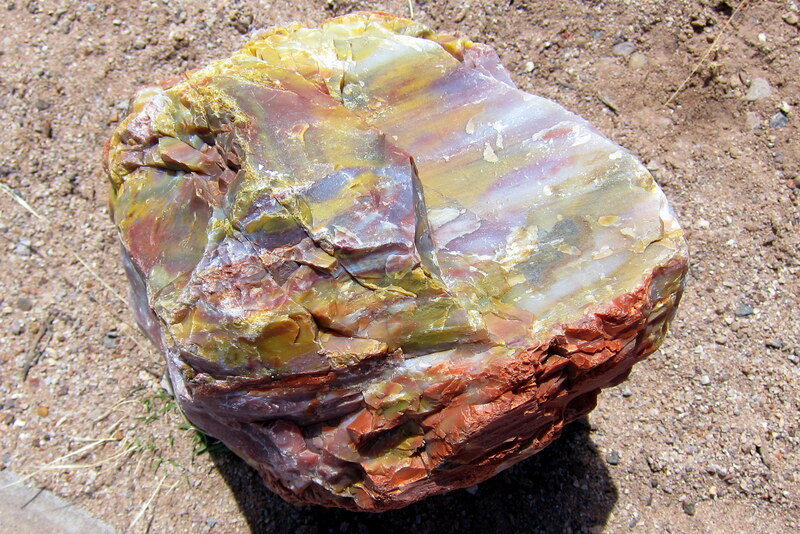 The stratified sandstone layers are colored by various minerals that give it the rainbow hue. 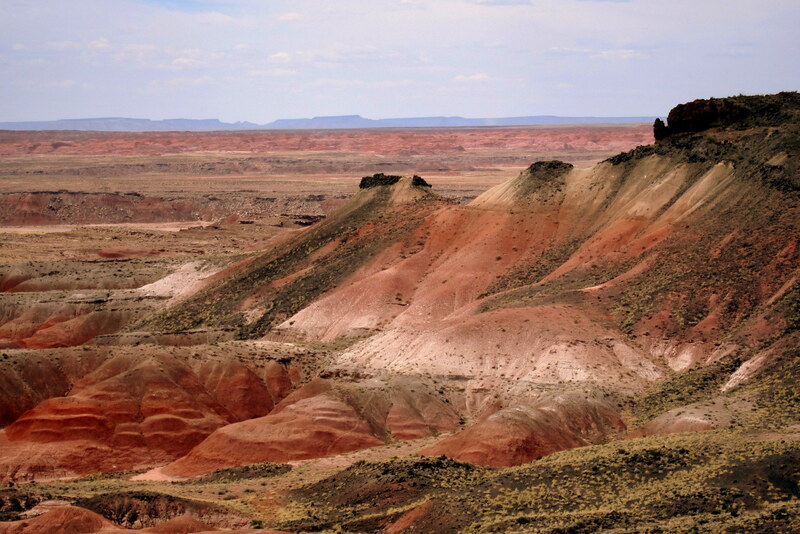 Much of this area lies within the Navajo Nation and is not easily assessable; however the portion protected by the National Park Service is easily visited. Within the park is an old Fred Harvey lodge that was built to accommodate tourist arriving by rail back in the early 1900’s. The lodge is now a museum but would be a really neat place to stay for a few days! 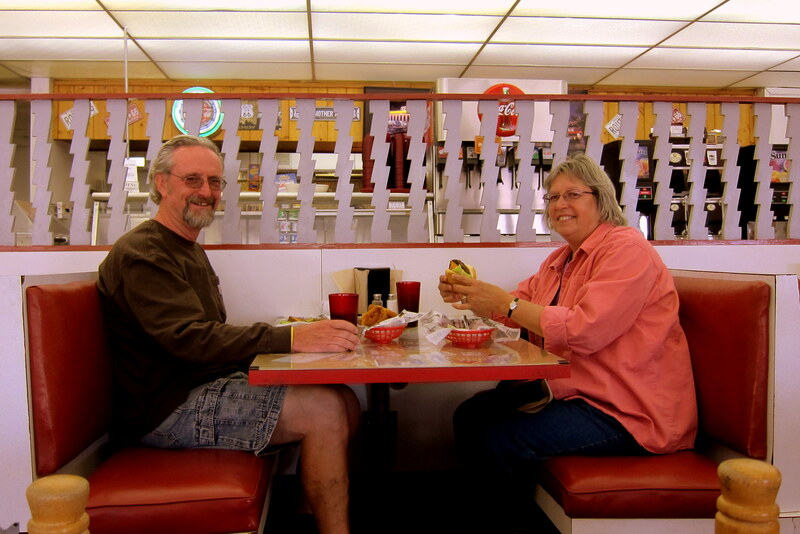 There is a diner attached to the visitor’s center that is still run by the Fred Harvey Company. Since it was way past lunch we decided to enjoy a meal. Afterward, we needed some walking around time and Kit needed some retail therapy so to the gift shop we went. 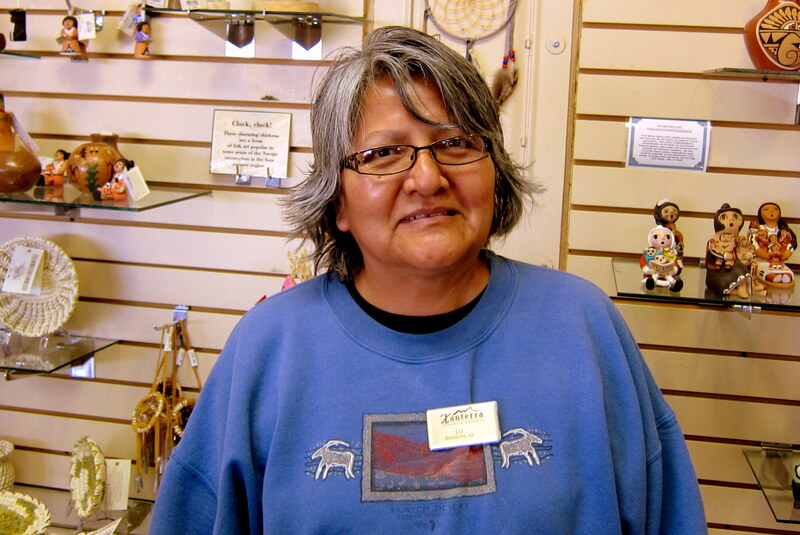 Since it was slow, I was able to visit with Lu, a Navajo tribe member that worked there. Lu was born on the reservation and much to her disappointment is the last member of her family that can still speak Navajo. It was obvious she was very proud of her heritage, especially the Navajo Code Talkers of World War Two fame. 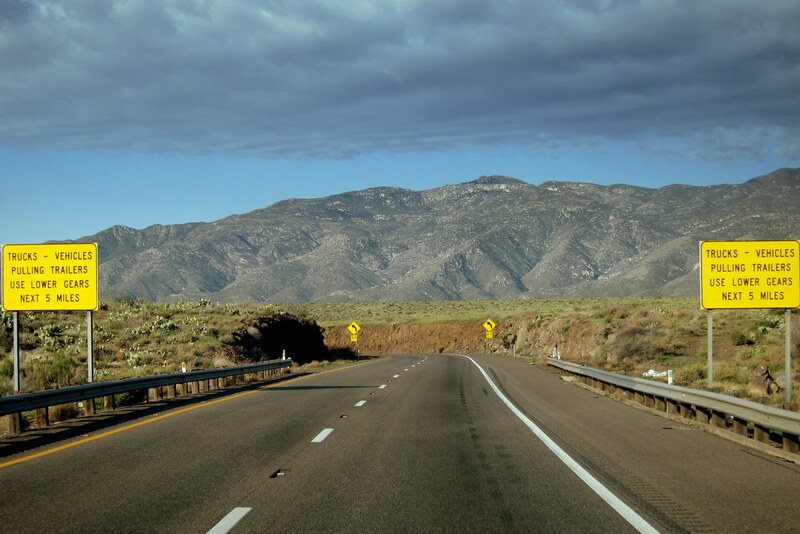 It was getting late, and we had no clue where we were heading or where we were going to camp tonight, so we once again chose I-40 to head east. 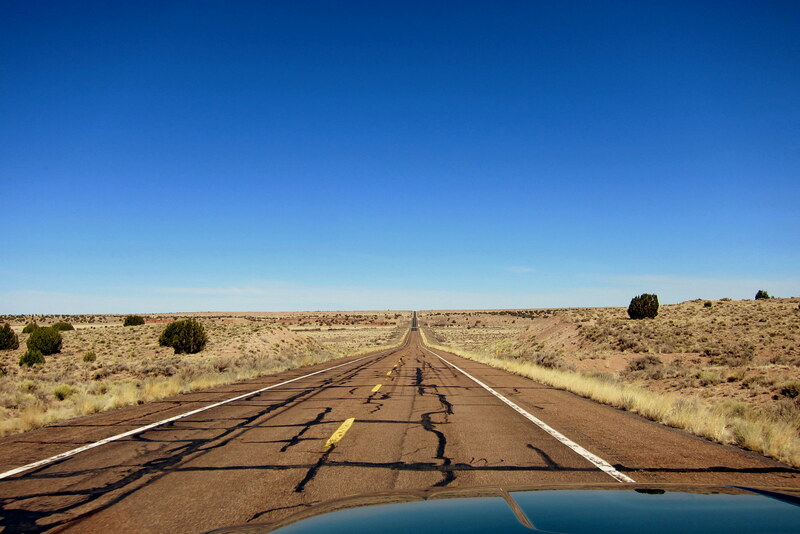 At 1645 we crossed into New Mexico and lost an hour to the Mountain Time Zone. An additional hour later we noticed there was a camping opportunity about 10 miles south called Blue Water State Park. When Kit called she got a recording that whey were busy and would return our call, so we guessed the place was open. However, after traversing some “interesting” back roads, one of which turned to dirt and featured a sign that read “Dead end 5 Miles”…..we were hopelessly lost. As it was beginning to get dark, we finally found the State Park entrance road with a locked gate! Finding our way back to I-40 tired and somewhat frustrated we motored on. 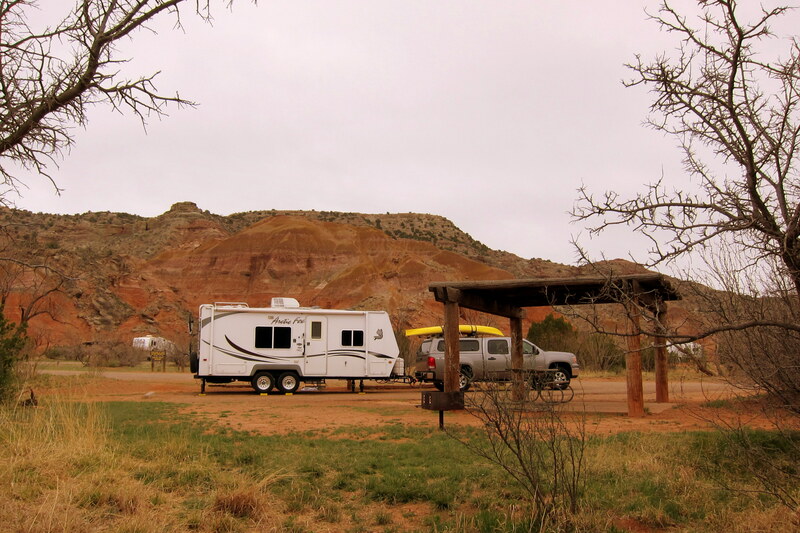 Around 2000 we happened onto an Indian Casino in the Pueblo of Acoma…..pulling in we found a rather austere campground but with full hookups and a very nice Indian Maiden that helped us set up. Long day, but all’s well that ends well! Sunday, April 14, 2013: Sometime during the night the wind picked up in velocity. Strong enough that our little camper was rocking on its stabilizers. Checking the weather forecast showed high winds all day, however since the winds were coming from the west and we were heading east we decided to make a break for it. Pulled out of the casino campground at 1045 under cool sunny skies with winds approaching 30 MPH. Back on I-40 we were fortunately not experiencing much effect from the winds so decided to continue the few hours to Albuquerque, NM. After a few minutes on the Interstate, we noticed a lot of heavy black smoke up ahead. Following the truckers that were merging over to the right lane, we tucked in behind an 18 wheeler and slowed considerably. Coming upon the source of the smoke our hearts sunk when we saw a motorhome fully engulfed! The heat was so intense that it had started a rather large grass fire which was being spread rapidly by the high winds. A couple of good samaritans were on the scene but no emergency personnel had arrived yet. Sure pray that no one was in that conflagration! As usual, I had my camera at the ready and was able to squeeze off a few shots of the horrific scene. However common decency prevents me from posting them in this journal. About 1400 we pulled into Albuquerque, and after a quick stop at Wal*Mart we decided to make it a short day and headed for Kirtland Air Force Base, just a bit southeast of town. Monday, April 15, 2013-Kirtland AFB, NM Campground: After the past few days, we need a down day to take care of a few domestic chores and just veg for a while. 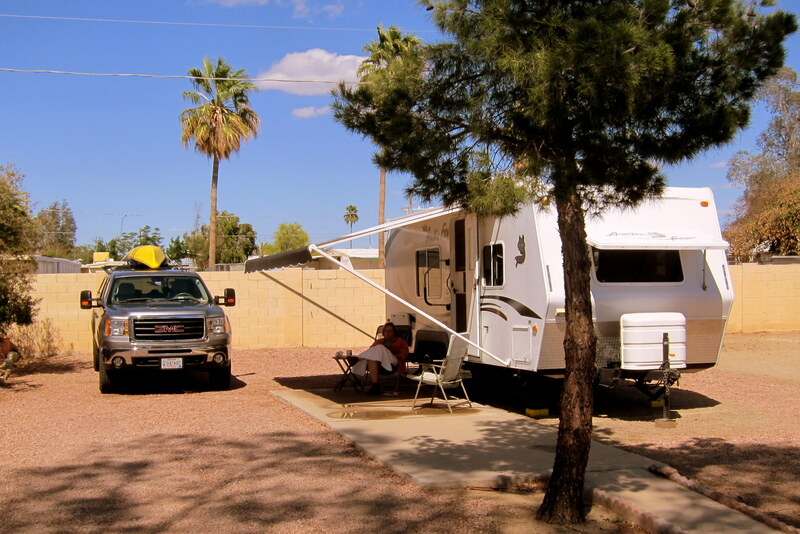 The campground has recently expanded and we were in the newer section. It was a nice day, so I decided to work on the “rescue bike” that I received from Kevin back in Vegas. New tubes, tires, rim strips, saddle and brake pads in addition to some cleaning, lubrication and adjustment got the old girl back in riding shape. However the brakes need some additional work which will have to wait until my return home. Not wanting to wait any longer, I took the bike out on its inaugural ride about the base, which is huge! Everything was going well until I came to this rather disturbing sign. 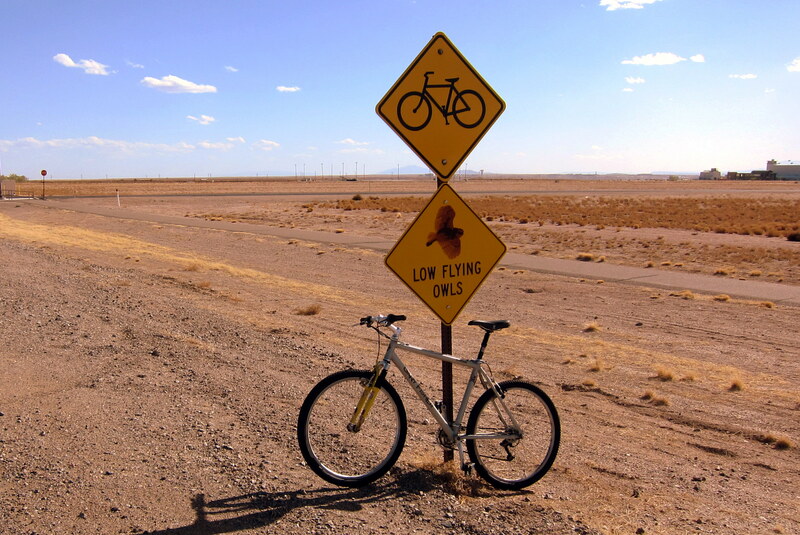 Apparently, in addition to narrow shoulders, sand and debris on the road, railroad tracks and inattentive drivers, there is a new concern for cyclists in this neck of the woods. I slowed down quite a bit but never encountered any Kamikaze Owls…..I did come across this fellow however lurking about the far reaches of the base. 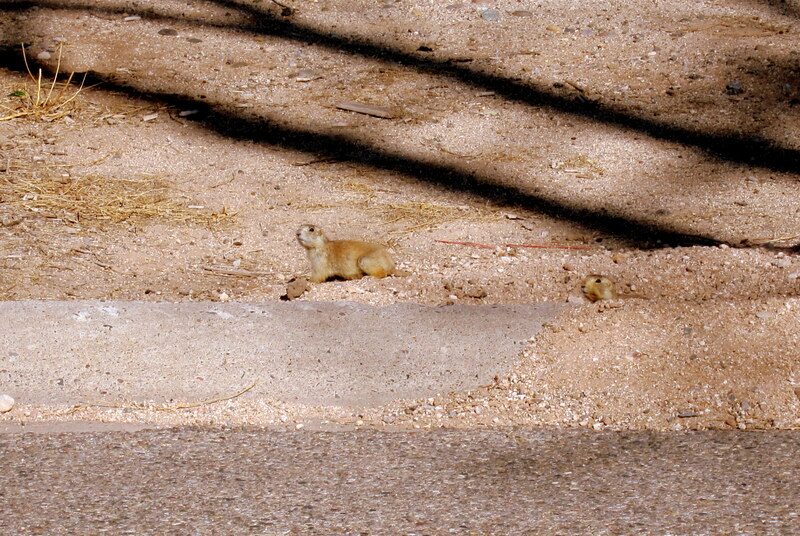 Then I spotted these little fellows scurrying about. See if you can figure out what happened next? Great ride…..unfortunately I “double flatted”, yep two flats due to these little suckers! There called “Goatheads”, are hard as rocks and are murder on tires without thorn proof tubes and tires…..who knew? Since my bike riding was over for the day, and since there was a nice breeze, and since there was a nice large vacant lot next to the campground, I spent a few hours flying kites. A pretty nice day all in all. 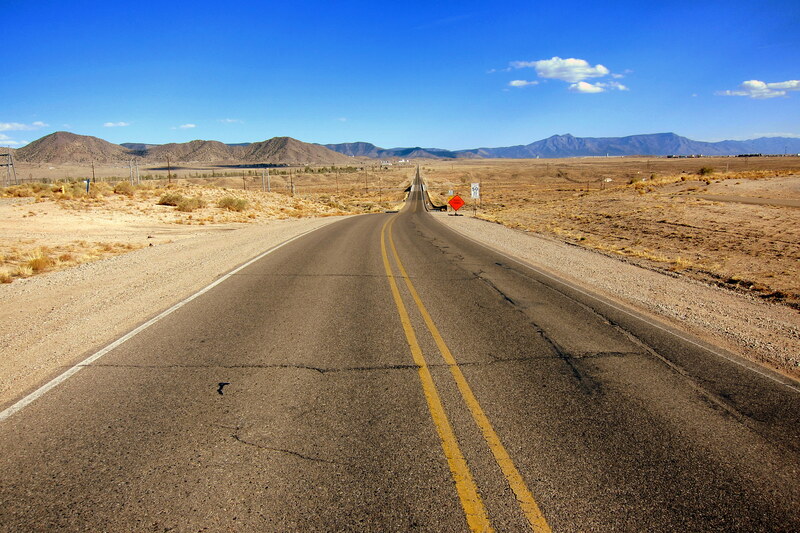 Tuesday, April 16, 2013: Up and on the road early….it is still a bit windy but the temperatures are in the 70’s and the sky is clear…..perfect traveling weather! Didn’t get too far, however as we came across this must see attraction. 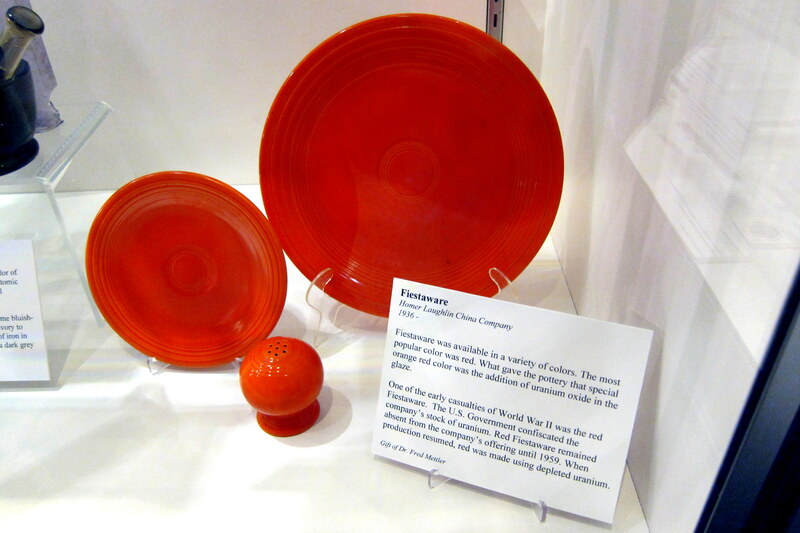 The National Museum of Nuclear Science and History is an interesting collection of all things Atomic. 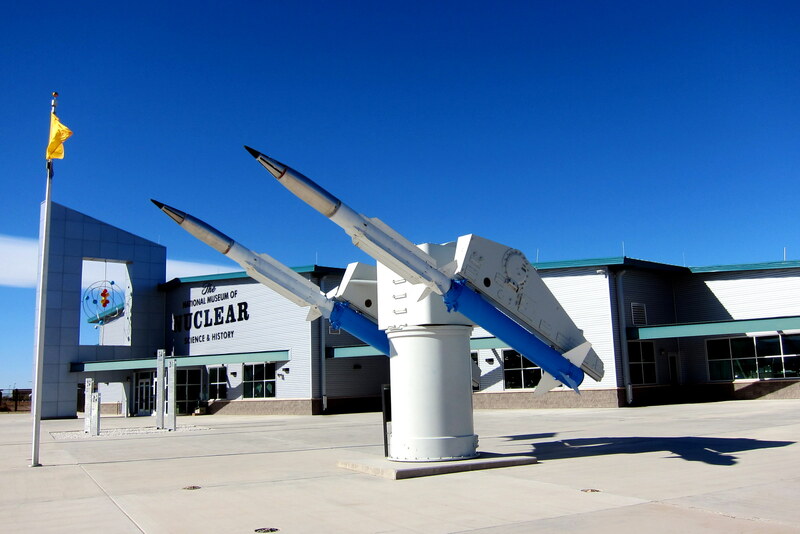 Regardless of how one views the history of nuclear evolution, this is one interesting museum! Arranged in a chronological sequence of events, and without any political spin, the artifacts and displays leave one to feel comfortable at arriving to their own conclusions. 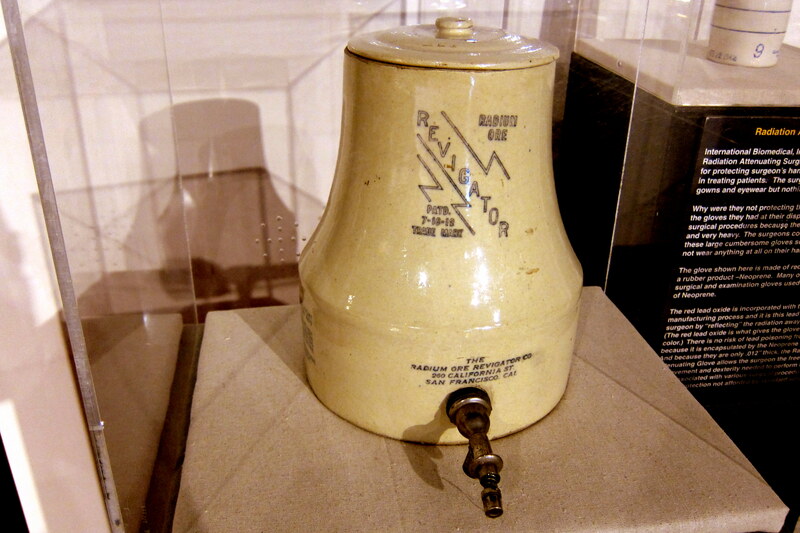 After chronicling the discovery of radiation and its early use as a medical aid such as this uranium laced water jug. 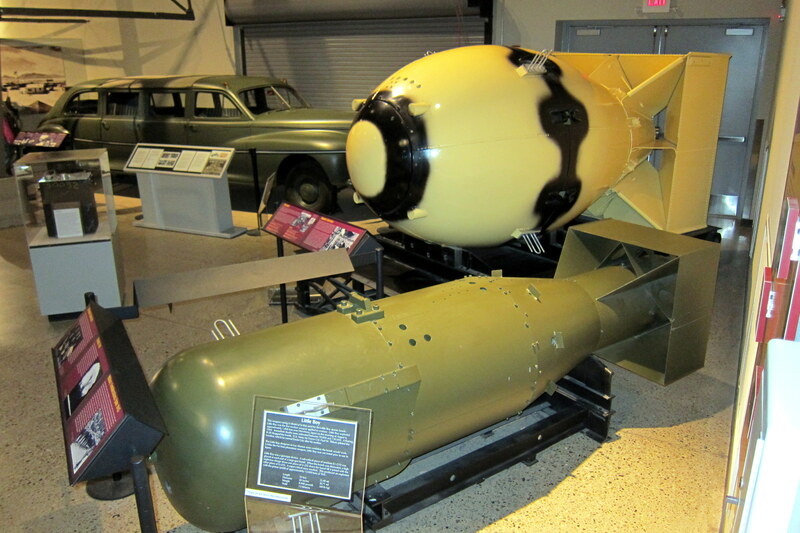 There was a section on the Atomic Bomb’s, Big Boy and Fat Man which were used on Nagasaki and Hiroshima during World War Two and finally convinced Japan to surrender. I find it kind of interesting that a war that was brought to America by the Japanese air attack on Pearl Harbor was brought to a close by a decisive air attack against Imperial Japan. 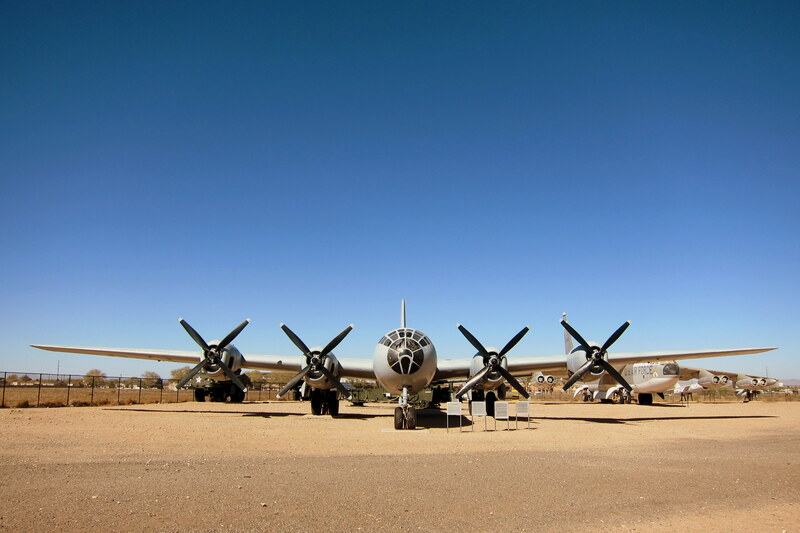 There was also a B-29 similar to the one that carried and delivered the first, and possibly the last, Atomic Bombs. 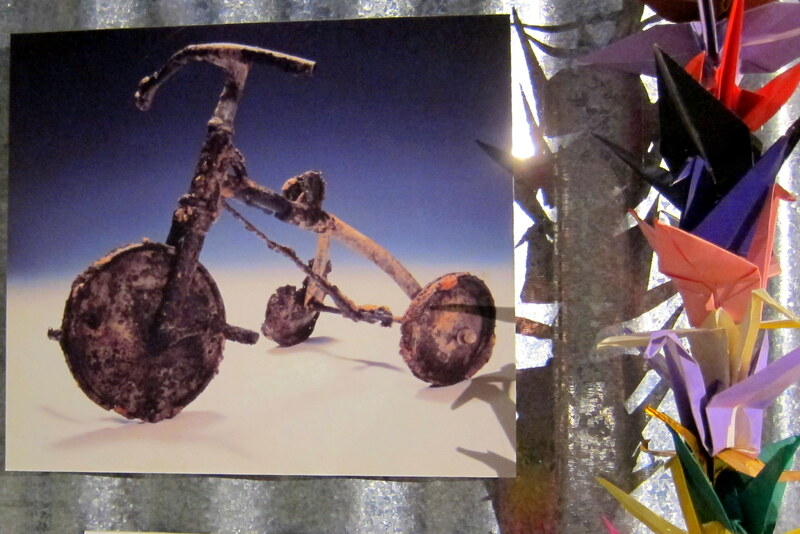 And a child’s tricycle discovered amongst thebris after Hiroshima was destroyed. Notice the paper cranes to the right of the burned tricycle. 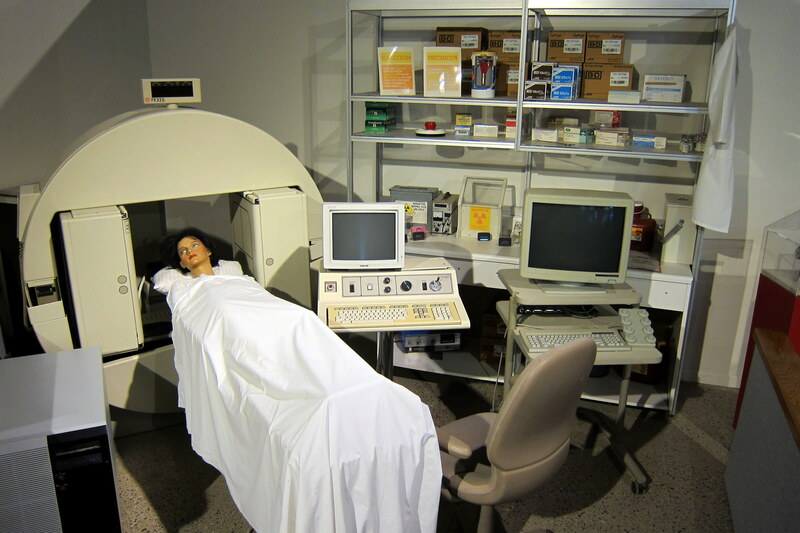 Sobering images all….however there have been many nonmilitary uses for Nuclear Science as well, such as in the world of medicine. And in consumer products, such as Coleman Lantern Mantels, Kitty Litter and Fiesta Ware! After a thoroughly educational tour of the National Nuclear Museum, one that Kit liked as well, we did indeed hit the road for parts easterly. Back on I-40 we rolled into Texas about 1533 and once again lost an hour…..this time (pun intended) to the Central Time Zone. Within a few hours, we started to see less desert and more cattle ranches and agricultural fields as we neared Amarillo. 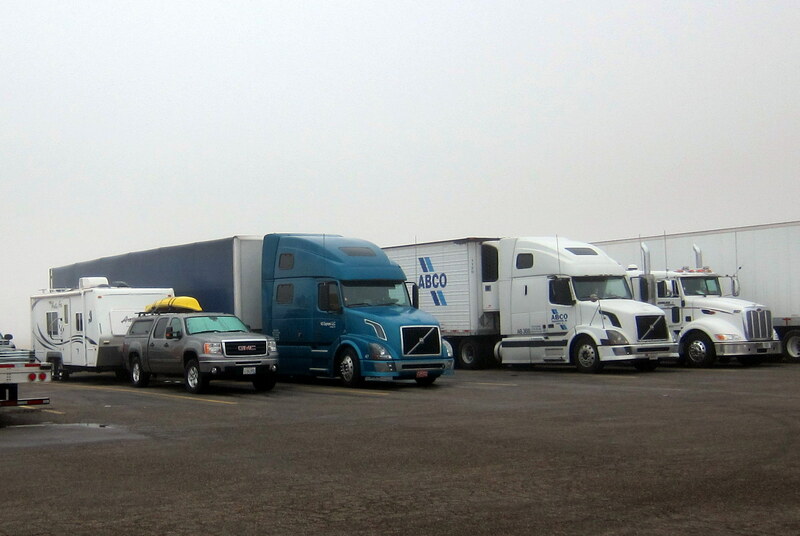 Not seeing any place to camp nearby and getting kinda late we decided to pull into a Flying J truck Stop and nestled in amongst the big rigs for the night. Wednesday, April 17, 2013: Up and as usual we check the weather before pulling out. Severe thunderstorms, damaging hail and tornados predicted dead ahead in Oklahoma! Yikes!! So we reassess and prudently decided to halt our easterly migration and lay low for a day or two. Now when I say low, I mean below the surrounding countryside. 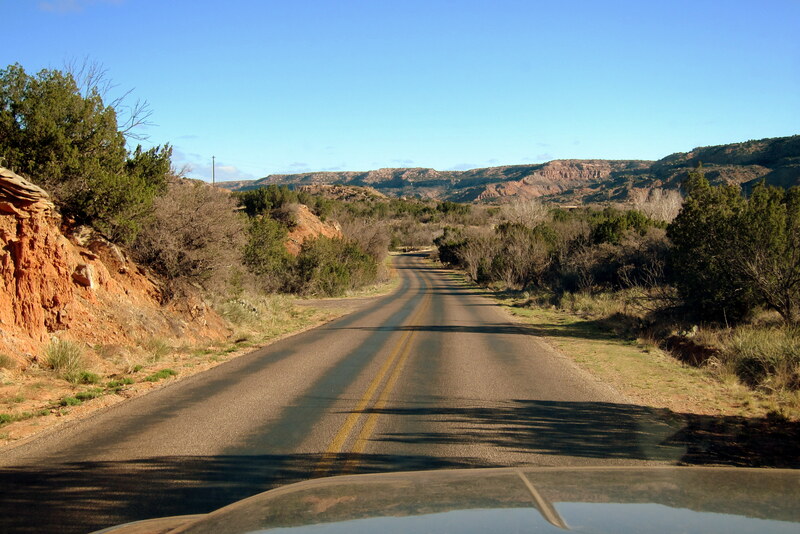 We headed south toward Palo Duro State Park, which features camping at the bottom of America’s second largest canyon. Checking in we settle for a nice remote campsite at the end of the park. It was cold but the winds were calm and the day was young, so I decided to take care of some truck and trailer maintenance and see if I can locate that intermittent and frustrating water leak we noticed last week. After some contortionist moves I finally could feel the location where the leak was coming from. 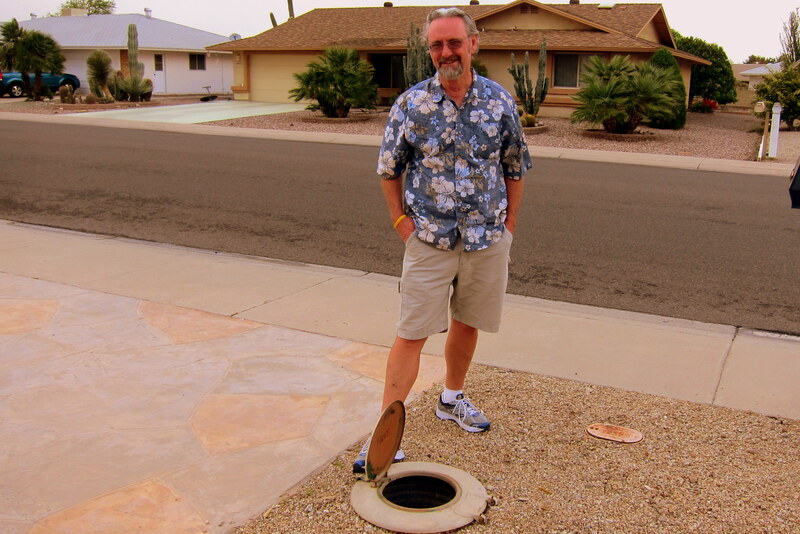 Couldn’t see it but it felt like the coupling supplying water to the commode had been cross threaded…..funny it didn’t leak right after we had the commode changed out last month in Tucson. In order to fix it correctly would require a major dismantling of components and interior walls, a task I didn’t want to attempt on the road. So I carefully took about a quarter turn on the fitting and the leak seemed to stop. It’s a watchful waiting situation for now with the hope the union doesn’t break free. 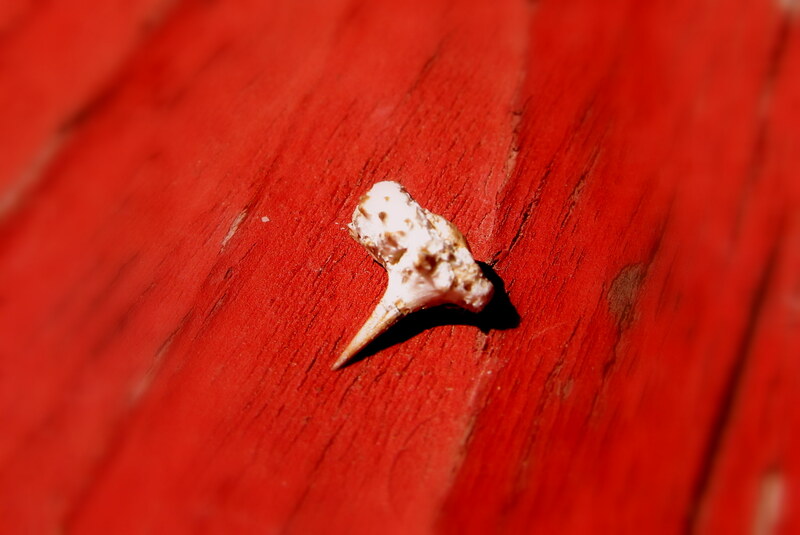 Thursday, April 18, 2013: I was awakened shortly after sunrise by an unusual sound coming from outside. 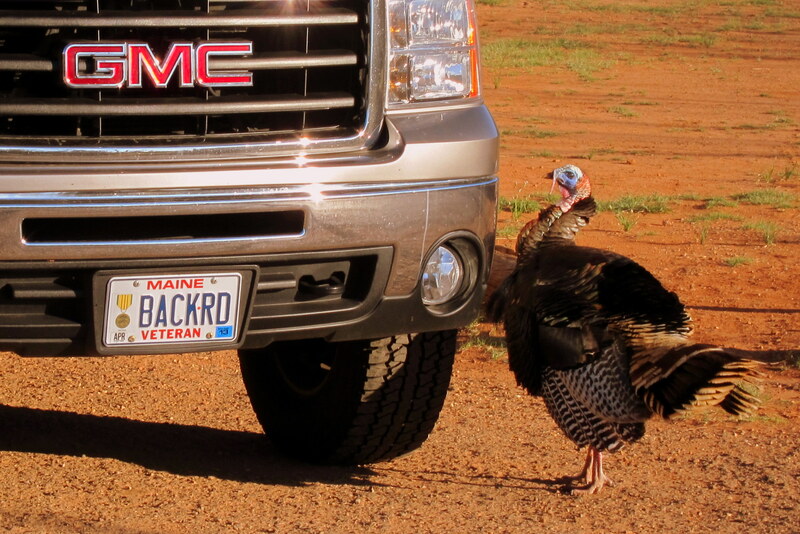 As I cautiously opened the door and peeked out I witnessed this turkey messing with my truck! Silly Tom was all puffed up and pecking at his reflection in the trucks bumper. He went at it for a few minutes until I guess his head hurt enough that he just gave up and left the perceived interloper alone. Funny sight to wake up to in the middle of nowhere! No cell service, so do not have a clue what the Oklahoma weather forecast is, but we decide to break camp and pull out anyway. Heading up canyon and down some back roads we make our way to I-40 once again. It looks like the weather has improved so, following a quick truck stop breakfast we once again resume our journey. Oklahoma, here we come! Kit’s Corner: We always enjoy our time with Martha, Tommy and Mr. “O” in Sun City. And, I love staying at Tiny Town, too! Such a nice facility, the weather is perfect and all the people there are really nice. Time to head east, this time, we plan to finally see Oklahoma. We’ve been north, south, east and west of it but NEVER have set foot in it. It’s one of just 3 (4 for me) states we’ve never been to. The others we are missing are Kentucky and North Dakota and, for me, Alaska. You went to the wrong house, thinking it was Marti and Tommy’s??!!! Hahahaha!!! It was funny, and we made a new friend! Might just have to start randomly knocking on doors and see who or what answers! Bennett to kirtland…sister in law was stationed out there and some of us went out there to see them. Nice place. It was a nice place, another place we need to explore more extensively. 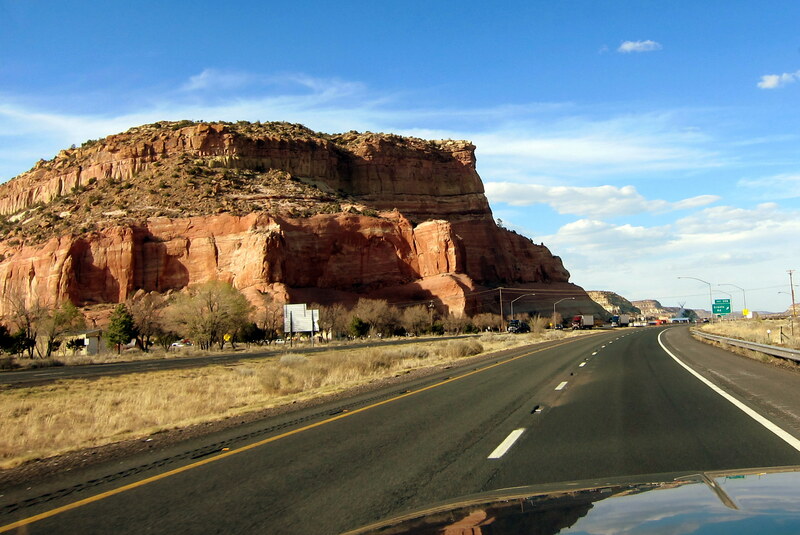 Ah, adventures on I-40, we’ve had a few similar ones, too. Winds so high we were advised to hunker down and not travel ’til the next day. But we paid no heed and ended up with an unwound and ripped slide-topper. Saw a motorhome down in a ditch and turned completely around and facing the direction it had just come from…there were 2 big-rig wreckers there with the drivers just scratching their heads. Also, just a ways west of Amarillo was where we came abruptly to a dead-end on Route 66 driving a 38′ motorhome towing a car. Sterlin took off “cross country” to I-40 through construction and fortunate we made it without further incident. Must be something about I-40! On a more recent note, we arrived home last night and opened the cellar door to see about 2.5 feet of water and everything floating. Today has been an interesting day. We’ll tell you about it very soon now. 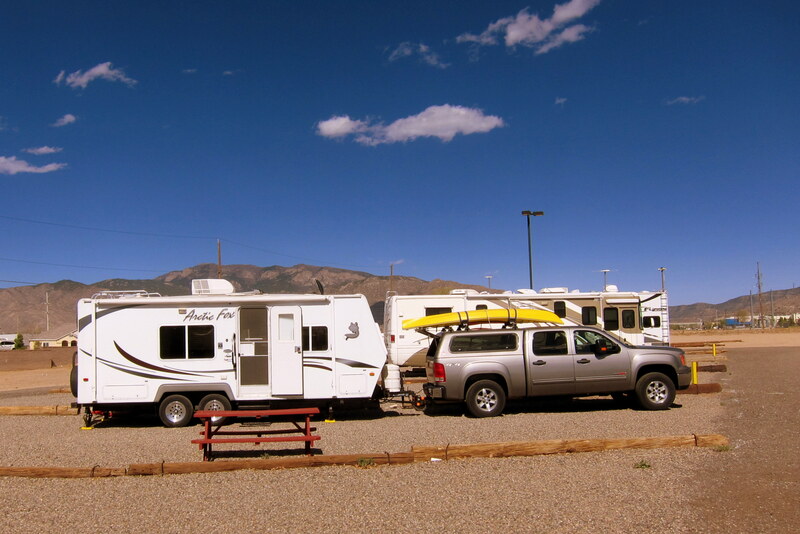 Thanks for sharing your I-40 RVing experiences. As you know, we don’t particularly like interstates but sometimes traveling on them is inevitable. Sorry about your basement water damage…..that’s an occurrence I worry about as well. Hope to see you all soon!